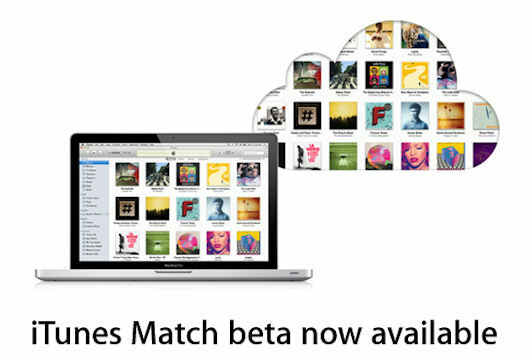 Developers now have access to the iTunes Match beta. iTunes Match is how Apple will provide cloud-based music services; rather than requiring a user to upload his music library like Amazon Cloud Drive and Music Beta by Google do, Apple will scan your drive for "matches" against a library of music on its servers. A user can receive a benefit this way, as well. The music on Apple's servers will be used, even if of higher quality than the users. In addition, since Apple can't really tell the difference between pirated and legitimate music, the music labels will actually make some money off pirated tracks matched against Apple's server copies. iTunes Match beta is currently only available to U.S. developers. In order to use it, besides having a developer account with access to iOS 5 beta, a user must download the latest copy of iTunes 10.5 beta, install it, choose Turn On iTunes Match from the Store menu, and click "Subscribe for $24.99." Apple has made the opportunity to subscribe attractive to developers. Not only do they receive iTunes Match free during the beta period, they will get an additional 3 months for free along with a 12 month paid subscription. Apple warns, however, that since this is a beta, users "must maintain a local backup of your iTunes library as well as any music you add to iCloud." Apple will periodically reset a user's iCloud library during the beta. In addition, some features and optimizations of iTunes Match will not be available during the beta.